Malcolm Murray will launch his new book The Philosopher, a collection of one-act plays at the Playwrights Cabaret on Saturday April 27th at 7 pm in the Faculty Lounge of the Main Building at the University of Prince Edward Island. Hosted by the PEI wing of PARC (Playwrights Atlantic Resource Centre), the cabaret celebrates Island playwrights with readings of their plays. The Cabaret is hosted by PEI PARC members Orysia Dawydiak and Yvette Doucette, with readings by Rob MacDonald, Catherine O’Brien, Nadine Salami, among others. 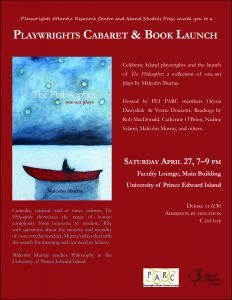 Malcolm Murray and friends will read selections from The Philosopher, which will be available for sale. Doors open at 6:30 pm, with a cash bar and nibblies. Admission is by donation.